Acumatica is a True Cloud ERP solution, built from the ground up for the cloud. It is the only cloud solution that gives you the control and flexibility of your system and data. The top cloud ERP systems out there box you in to their cloud, and force your upgrade schedule so that you are no longer in control of your most critical systems handling your financial data. They also box your organization in because of their per user pricing model that limits your whole organization from having access to your ERP system. Choose the wrong ERP system, and your business will be affected for years. Productivity: How will it increase your productivity? Functionality: What features does it offer? Technology: How does it leverage technology? Value: How does the product’s lifetime cost compare to what you’re getting? Risk: How does it minimize risk and facilitate security? Cloud computing (“the cloud”) is one of the leading technology topics in the world. Cloud computing, sometimes called on-demand computing, uses the Internet to provide shared computing resources and storage of records or documents. The term covers everything from emailing or photo sharing on a commercial service like Google to hosting the entire computing infrastructure of a global corporation from remote data centers. Cloud ERP enables a company’s accounting, operations management and reporting to run in the cloud. As one would expect, Cloud ERP vendors vary significantly in their technology, functionality and service. 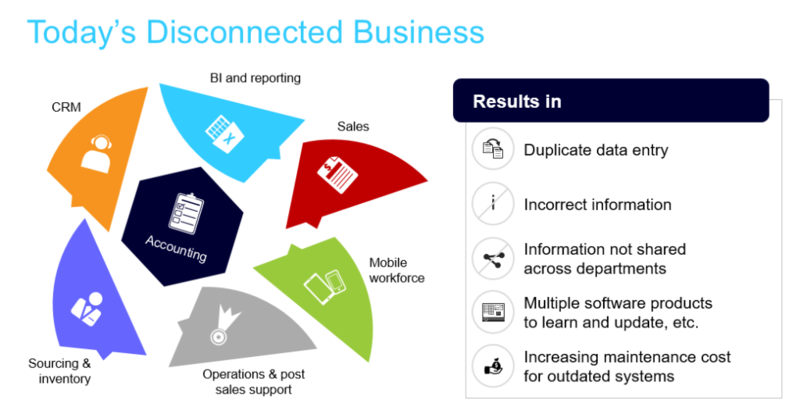 After researching ERP cloud vendors, it becomes clear that they have few things in common beyond hosting of an application and utilizing the internet to provide connectivity. 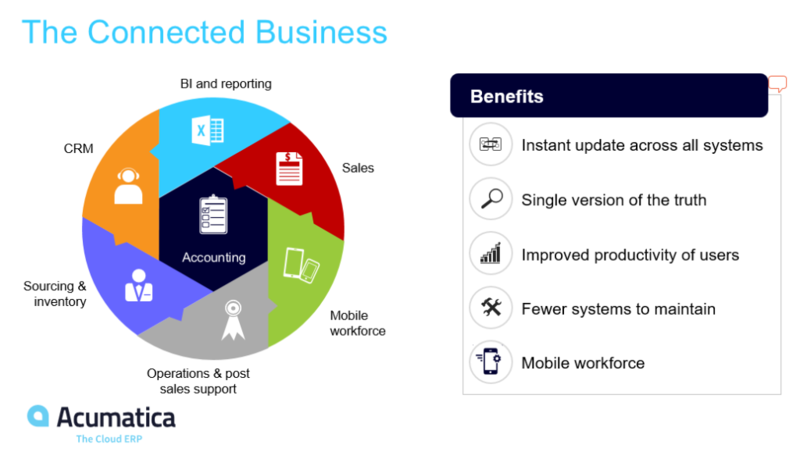 Acumatica Cloud ERP is a flexible and cost-effective option for small and medium-sized businesses. More importantly, it is designed to respond to and overcome the inflexibility of many existing ERP solutions. The other major players in the ERP cloud space are in complete control of the system deployment location and the upgrade schedule. I was talking to one company owner recently and he said he was leaving one of the other providers because he did not like the upgrades being dictated by the company and wanted to now host it locally. He was always having problems each time he upgraded. Because of this he will be looking at Acumatica next year when his agreement is up; he wants to go to a more flexible solution. He has been with the ERP company from the first year but is tired of the upgrade troubles and wants more control. Acumatica is the only True Cloud ERP to allow you the flexibility of where you host it and when you upgrade your software. With Acumatica you can deploy it on Acumatica’s cloud, a private cloud, or on-premise. You can change it at anytime too. You can go from the cloud to on-premise the next day. Acumatica allows you with the consultation of your VAR to determine the best time to upgrade the system. Acumatica also enables you to get the data out of the system easily if you had to go to another system for some reason. It is very difficult and costly in the other cloud ERP systems to get your data back. Acumatica believes the data is yours and you should have control over it. Not all “ERP Cloud” Solutions are equal. Many old on-premise ERP providers are rushing to the cloud because they see many businesses asking for it. 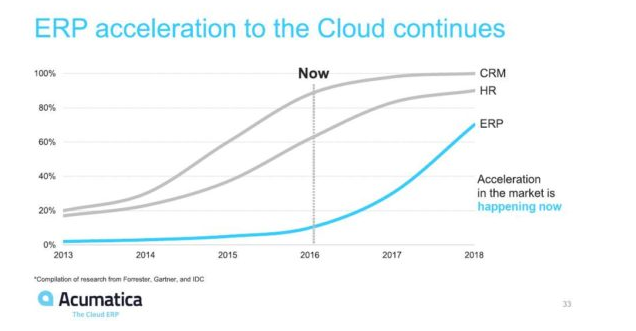 The problem is because they were not developed from the ground up with technologies built for the cloud so they are patching their systems to look like they are cloud ERP. If you remote into a server and logon to a cloud desktop then you are not on a “True” cloud ERP. You should be able to log into the ERP from any browser by just putting your company url in the web browser. Also if you have to remote into the cloud network to run reports and financials then it isn’t a true cloud.